Steven Barnes is a genuine pioneer. He is also a writer’s writer, expressing his endless creativity in forms ranging from comic books to novels to short stories to screenplays. 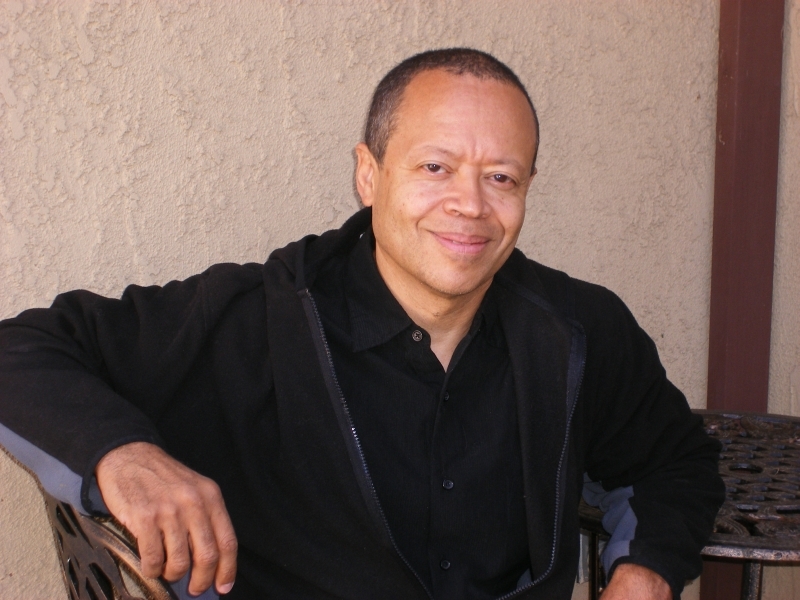 The novelist, screenwriter, writing instructor, and life coach has published more than 25 science fiction, fantasy, and horror novels, written New York Times bestsellers, and won an NAACP Image Award. He has been nominated for Hugo, Nebula, and Cable Ace Awards. His modern classic “A Stitch in Time” episode of Showtime’s The Outer Limits won an Emmy. He has also has written for The New Twilight Zone, StarGate, Andromeda, Ben 10, The Wizard, and The Real Ghostbusters. Most recently, Barnes and his longtime wife and collaborator, Tananarive Due, co-wrote and co-produced a short zombie film, Danger Word, based on their YA zombie novel series Devil’s Wake and Domino Falls. The film was nominated for Best Narrative Short at two film festivals. Based on that film, Barnes and Due optioned the books to producer Tonya Lewis Lee, wife of director Spike Lee. Barnes’s wife calls him “The Wizard” when it comes to concocting new story ideas. And that he does. Whether it’s a coming-of-age zombie story (Devil’s Wake) or an alternate history about the Americas being colonized by Africans bringing European slaves (his Endeavor Award-winning Lion’s Blood and Zulu Heart), Barnes’s fiction is always about The Big Idea beneath the surface of life — what humans most crave, fear and aspire to. During his career, he has collaborated several times with science fiction giants Larry Niven and Jerry Pournelle, and rubbed shoulders with legends Harlan Ellison, Ray Bradbury, and Robert Heinlein. And he is a part of the very small family of early black science fiction pioneers that included Samuel R. Delany, Octavia E. Butler, and Charles Saunders. In 2013, he appeared at Spelman College’s Octavia E. Butler Celebration of the Fantastic Arts with Delany, Nalo Hopkinson, Jewelle Gomez, Sheree Renée Thomas, Nisi Shawl, Brandon Massey, and Tananarive Due. He has also been interviewed for the forthcoming documentary Invisible Universe: A History of Blackness in Speculative Fiction. His first novel with Larry Niven in 1981, Dream Park, sparked the contemporary Live Action Role-Playing (LARP) game phenomenon, notably the International Fantasy Games Society (which began as fiction in the book). In the mid-1990s, the Dream Park Corporation tried to make the book’s fictitious premise of a role-playing theme park a reality. Barnes and Due are also co-authors of the NAACP Image Award-winning Tennyson Hardwick mystery series, which launched a groundbreaking Vook (video book) with film excerpts they wrote adapted from the novel From Cape Town with Love. But as important as Steve’s work has been in fiction, his true love is teaching balance and enhancing human performance in all forms: emotional, professional, and physical. In addition to being an author and writing instructor, he is also a life coach, CST coach, and certified hypnotist. He has more than 30 years' experience in the self-development arts, including hypnosis certification with Transformative Arts Institute in Marin, CA, training as a yoga and Tai Chi instructor, and fourth-degree black belt in karate. He has counseled executives, royalty, prominent politicians, and Hollywood celebrities at the Moonview Sanctuary in Santa Monica. Steve has gained a unique understanding of the relationship between myth, energy, and consciousness, and has shared it with thousands of students and clients since 1980. In addition, Steve has lectured at UCLA, Mensa, and Pasadena JPL; taught at Seattle University; hosted the Hour 25 radio show on KPFK; been Kung Fu columnist for Black Belt Magazine; been a "Starred Speaker" at the L.A. Screenwriting Expo; and been profiled in countless magazines, newspapers, radio shows, and webzines. His coaching credentials include: CST (Circular Strength Training) Coach, Certified Softwork Instructor, Certified Ericksonian Hypnotist (Transformative Arts Institute, Marin California), Fourth Degree Black Belt (BKF Kenpo), Yoga Instructor (trained at Yoga Works in Santa Monica, California), and Tai Chi instructor. Ladies and gentlemen, your Guest of Honor — Steven Barnes. Originally published in the Souvenir Book for Detcon1, held in Detroit, MI, July 17-19, 2014. Detcon1 was the 2014 NASFiC (North American Science Fiction Convention), and Steven Barnes was the Author Guest of Honor.